Somebody has stolen all the candies from a hero town, so Halloween celebration is under threat. Our brave character decides to return the stolen sweets and bring the celebration back. Enter the graveyard to pick all candies on the levels to open Crypt. 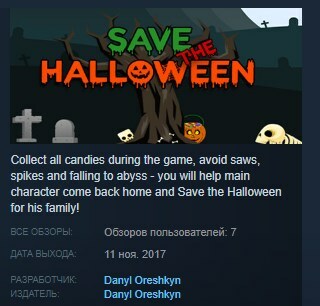 Collect all candies during the game, avoid saws, spikes and falling to abyss - you will help main character come back home and Save the Halloween for his family!